I’m going to let you in on a little secret here. With all the mountains, fjords, shores, waves, and not least aurora borealis going on up in Lofoten right now, it may be hard to understand, but we have trees in Norway too! Dozens of them 🙂 Actually large parts of Norway is covered with woods, many of them almost untouched. This is from such an area. I set out one very early morning to capture some fall-foliage in a remote location. On my way out, this scene captured my attention. The low, warm autumn-morning light lit up the trail in front of me and even though the scene per-se was somewhat ordinary (in lack of a better word) the light gave away the image. By the way, I didn’t find any fall-foliage to speak of that day, but I actually stumbled upon a dense rainforest-like pocket with the most intense green moss and ferns I have ever seen. But thats a different image and story. Hope you like this one, have a splendid tuesday! 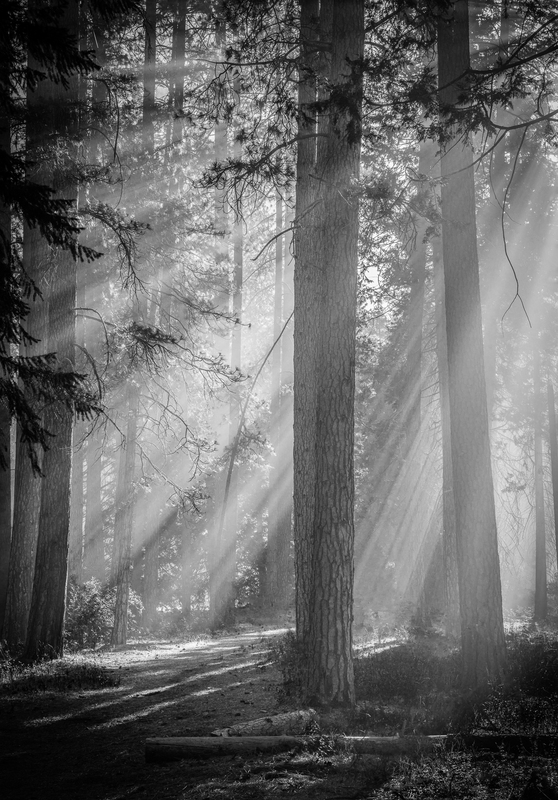 2015 – more forests and B&W! Beams. Yosemite Valley, june 2014. Now, I’m not really a guy for making new-years resolutions. However, every now and then I scrutinize my own images and adjust my direction somewhat to have the right all-over balance in my work. I have decided that I will try to work a little bit more with forests and trees and more in black and white this year. Ok, now I’ve said it. Hope I can live up to that. I will start with preferring forest-destinations when I have no specific other plans, and also plan to submit a few more images to dedicated B&W competitions. This image is from Yosemite Valley an early morning in june 2014. I was driving into the valley and saw some light mist covering El Capitan Meadow. I stopped my car there and walked into the forest of giant trees by the foot of El Capitan. A truly magical morning! Hope you like it, have a super weekend! Ok, I promised that my next post was going to be about equipment. However, I just returned from my trip to the German alps and have started to process images, so I wanted to share this new release in my gallery first. Bavaria has so much to offer the landscapephotograper, and I was really lucky with both weather and the autumn colors which seemed to peak last week. More images from the Alps in the weeks to come!